In this article I consider the problems caused by Japanese Knotweed and some of the types of legal claims that can be made, in the light of some recent court decisions. Fallopia Japonica is a large herbaceous perennial of the knotweed and buckwheat family Polygonaceae. It has a number of common names, often related to animals – elephant ears, donkey rhubarb, monkeyweed, but perhaps the most appropriate is the Chinese: tiger sticks. European adventurer Philipp Franz von Siebold first transported the plant from a Japanese volcano to Holland. By 1850 a specimen from this plant was added to Kew Royal Botanic Gardens. It proved popular with gardeners because it looked like bamboo and grew in all conditions. It spread is thought to have been aided by rail and water networks. Japanese Knotweed is not difficult to find. If you are a rail commuter like me, you can usually look out of the window and see it along the sides of the track. It has hollow wooded stems with raised nodes that look a bit like bamboo, thick and straight at the base, but curving over elegantly at the top; the broad oval leaves are red initially, turning to dark green; in late summer and autumn it has small white flowers in spikes which stand upright from the crown of the plant. It is quite common to see patches where it has been partially treated, but with smaller new plants emerging from amongst the scattered dried stems. What will not be visible is the large underground network of rhizomes (roots) which can grow 10 feet down: it is these that make the plant so difficult to eradicate once established. To eradicate the plant the roots need to be killed. All above-ground portions of the plant need to be controlled repeatedly for several years in order to weaken and kill the entire patch. The right herbicide is essential, to travel through the plant and into the root system below. The growth of the plant can be significantly reduced by applying herbicides, but these have not been proven to provide complete long term elimination. Digging up the roots is a common, potentially quicker, solution for developers, but the risk is that if even a few centimeters of root are left in the soil, the plant will quickly reappear. More recent experiments have involved the use of biological pest control agents from Japan: the Mycosphaerella leafspot fungus and the aphid Aphalara Itadori. Sub-section 14(2) of the Wildlife and Countryside Act 1981 states that “if any person plants or otherwise causes to grow in the wild any plant which is included in Part II of Schedule 9, he shall be guilty of an offence.” Japanese, Giant and Hybrid Knotweed all appear in that Schedule. Private gardens are generally thought not to come within the definition of “the wild” and for what it may be worth, the Environment Agency Knotweed Code of Practice (published on 12 August 2013 but withdrawn on 11 July 2016) had stated that “It is not an offence to have Knotweed on your land and it is not a notifiable weed”. Sections 33 and 34 of the Environmental Protection Act 1990 contain prohibitions and duties relating to the deposit, treatment, keeping or disposal of controlled waste, which under the wide definitions in schedule 2B would include Knotweed material or soil containing it. 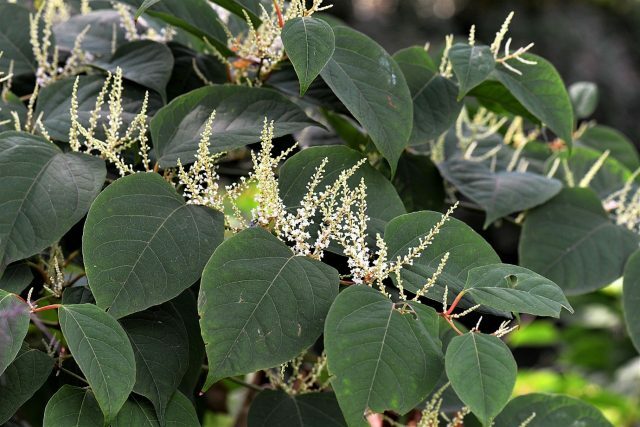 The Act does not explicitly refer to Japanese Knotweed (or any other species of invasive plant) but written guidance published by the Home Office indicates that a community protection notice could be used to require a landowner to address such a problem. The notice is to specify steps to be taken to remedy the condition of the land. Anecdotal evidence suggests that there can be difficult in persuading a local authority to exercise this discretion because of the question over whether Japanese Knotweed on a particular piece of land affects the amenity of the neighbourhood. “The essence of nuisance is a condition or activity which shall unduly interferes with the use or enjoyment of land. Private nuisance can be established under three broad headings. In a short sequence of cases, claimants’ whose land has been invaded by Japanese Knotweed, but whose buildings have not been physically damaged by it, have brought claims in private nuisance under the first and third heads. In two cases heard together, Williams v Network Rail Infrastructure and Waistell v Network Rail Infrastructure Lawtel 01.03.2017, the claimants were awarded damages by a Recorder in the Cardiff County Court for nuisance by Network Rail. The Claimants owned bungalows whose rear walls abutted an access path leading to an embankment, both owned by Network Rail. On the embankment was which a large stand of Japanese Knotweed, which had been present for at least 50 years. The evidence indicated that the Knotweed’s rhizomes had encroached onto the Claimants’ properties not only up to the foundations but also under the bungalows themselves. (b) they claimed that the presence of the Knotweed on Network Rail’s land was an interference with the quiet enjoyment or amenity value of their properties as it affected their ability to sell their properties at their market value. (5) as to relief: (i) the Claimants were entitled to damages to cover a treatment package for the Knotweed together with an insurance-backed guarantee; (ii) they were also entitled to damages for the residual diminution in value of their properties – sums of about £10,000 in each case; (iii) Mr Williams had also sought general damages for loss of amenity and interference with his quiet enjoyment of his land, for which he would be awarded £1,400. (2) found in favour of the Claimants on their claim for interference with their enjoyment of their land (Clerk & Linsell’s third basis). In this case the Claimants were not claiming damages, but solely an injunction to compel the Claimant to carry out an effective Knotweed management programme. The Judge granted the injunction. The Williams and Waistel cases were the subject of a leapfrog appeal to the Court of Appeal with judgment given in July:  EWCA Civ 1514. In short, the CA upheld the claims, but on different bases, thereby restricting on the recoverable heads of loss. (5) the broad unifying principle in this area of law was reasonableness between “neighbours”. (3) the Recorder’s findings on foreseeability and on Network Rail’s failure to take reasonable steps had been correct. The result was that the Claimants were entitled to damages for the cost of treatment and an insurance-backed guarantee, and Mr Williams was entitled to general damages. However they were not entitled to the more substantial damages for the diminution in value to their properties. The Law Society’s Property Information Form, 3rd Edition, TA6, is a form which sellers of property are required to complete as part of the process of selling their home, and the completed form will be sent to the purchaser’s solicitors. Question 7 in this edition of the form expressly refers to Japanese Knotweed, and asks whether the property is affected by Japanese Knotweed and if so, whether there is a Japanese Knotweed management plan in place. In each case the seller must answer “yes” or “no” or “not known”. A claim for misrepresentation can be made for a false answer given to a question in the Property Information Form. Thus for instance in Morrell v Stewart  EWHC 962 (Ch) the purchasers of a property including kennels and a cattery were awarded compensation for the diminution in value of the property arising from the sellers’ fraudulent misrepresentation in the property information form that remedial works had been carried out to stop the overflow of effluent onto adjoining land. It was held in that case that although the contract excluded contractual liability relating to the condition of the property, it did not exclude liability for fraudulent misrepresentation. I can foresee arguments about the interpretation of the question in the form as to whether the seller’s property is “affected by” Knotweed. What if there is Knotweed growing on an adjoining property: does that affect the subject property? What if the rhizomes, but not the plants above ground, have spread across the boundary? What if Knotweed on the subject property was eradicated years ago, apparently effectively (bearing in mind that the plant can apparently lie dormant for several years)? In such cases the availability of different species of misrepresentation might be important, since for example it might not be possible to establish the level of knowledge required for a claim of fraudulent misrepresentation. As ever, claims may potentially be made by property purchasers, or by their mortgage lenders. laims against conveyancing solicitors are certainly possible if for instance the buyer’s solicitor has failed to ensure that the property information form has been completed by the seller, or has failed to notice and advise the buyer about answers given by the seller which do reveal the presence of Japanese Knotweed. Claims are more commonly encountered against surveyors. These usually relate to the failure to spot the presence of Japanese Knotweed on the subject property or on a neighboring property. The Council of Mortgage Lenders has published guidance specifically relating to Japanese Knotweed. It requires valuers who inspect property for mortgage purposes to report to lenders where Knotweed is present. However, there is also scope for claims even where the surveyor has correctly identified the presence of Japanese Knotweed, but has given incorrect or incomplete advice about the scale or seriousness of the problem, or the estimated costs of remedial work. (c) information as to the estimated costs of remedial works. In my experience there can be difficulty in investigating whether a surveyor was in fact in breach of duty: the claim may be made several years after the survey report, and it may be unclear what would have been visible to the surveyor at the time: was the Knotweed as heavily established at that time as it was years later; had any attempt been made to conceal it at the time of the inspection; had it been treated shortly beforehand; was the inspection carried out at a time of year when the knotweed would have been less apparent? However, if the Knotweed would have been visible, the RICS paper will make it very difficult for a surveyor to succeed in establishing that he was not in breach of duty for failing to recognise it. Where a negligence claim is made against a professional, insurers will want to consider whether a contribution claim can be made against another party: another professional, the vendor of the property, or a neighbouring land owner. This means establishing under the terms of the Civil Liability (Contribution) Act 1978 that “the same damage” was caused to the claimant by the defendant professional and by the other party. This may not cause any difficulty in the case of a contribution claim between professionals, for example, as in a case in which I was instructed, where a surveyor seeks a contribution from a solicitor, or vice versa, where both have failed to report the presence of Japanese Knotweed and a claim is made by a mortgage lender. But a professional facing a claim by a property purchaser would have to give careful thought to a contribution against a neighbouring land owner. The purchaser would be claiming damages from the surveyor in relation to the “diminution in value” to the property. It may be questionable whether a neighbouring landowner would be liable for the same damage, given the Court of Appeal’s conclusions in Williams that nuisance consists in the interference with the use and enjoyment of land, not the reduction in its value as an investment.